For this last video in the introductory section, we need to talk a little bit about this module in Magoosh, and in particular talk about how to approach sentence correction. So, first of all, grammar overall, English grammar, that's a huge topic. Effective writing is a huge topic. It, in fact, is a very worthwhile goal if you have the potential to be a great writer, by all means, develop those skills. If you're able to do effective writing, You will always have a job, that's very important. But, it's very important to keep in mind that all those high standards, what it is to be a great writer, we don't need that. All we need to do for sentence correction is we need to know the particular rules, the grammar rules, the logic rules on which the GMAT focuses. So, in this module, when we go through all these videos, you're actually gonna get a very thorough introduction to everything that the GMAT covers on sentence correction. This will be perfectly sufficient. You do not need to run out and buy a giant grammar book or a giant book on how to be an effective writer. That would be overkill, that would give you far more information than you actually need. Another important point is most sentence correction questions, for example almost everything in the official guide, tests multiple issues at once. This is very important to appreciate. So, for example a typical question, we have a grammar mistake but we also have some logic mistakes floating around, we also have some rhetorical stuff floating around. So, basically if you think about how our lessons are laid out, you'd have to finish all our lessons before you can interrupt everything that's going on in this question. And in fact, this is typical for most sentence correction questions. So, this has some implications for how we organize the module. These are the lessons in the module. Now, let's think about this for a second. If you think about the math lessons, what happens in the math lesson, is after ever module, maybe you do integer properties or probability or geometry, after every little bank of videos, you have a quiz. And that's actually good pedagogical technique. Learn some ideas, then take a quiz on it. It doesn't quite work in exactly the same way on sentence correction. These first two modules, Introduction and Grammar Basics, there are no quizzes at the end of these modules for the simple reason, for example this is the last video in the introduction. We haven't talked about any content yet. We've only talked about overall general strategies. And in fact, in the grammar basics when we talk about a noun and a verb and an adjective, that's far more basic than what the sentence correction is asking. Sentence correction is not testing whether you know the difference between a noun and a verb. So, even though that's important to know, you're not ready to answer questions at that point. Starting at module number three, Verb Form, that's when we'll start to have quizzes. But it's very important to appreciate, we at Magoosh are highly constrained as to the types of quizzes we can give you after section three, after section four. In other words, we can only give those questions that test only those ideas. Now, there will be a few questions on the GMAT that just test verb form or just test the agreement, but, it's very limited. It's only as we get towards the end of the section, toward nine, eight, nine, and 10, that we can start feeding you questions that actually look like full GMAT sentence correction questions, ones where all the issues at once are contained in a single question. Most of the questions in the official guide are of that quality. Most of the questions in the official guide you would not be ready to handle until you've watched the entire set of videos. So overall, first of all there are no quizzes in section one or two. So, you're off the hook. There's not a quiz right now at the end of this video. Second, the quizzes get progressively more GMAT-like as you move through the sections. In other words, the quiz after lesson three, Module three, that's not gonna look a whole lot like the full panoply of sentence correction on the GMAT. 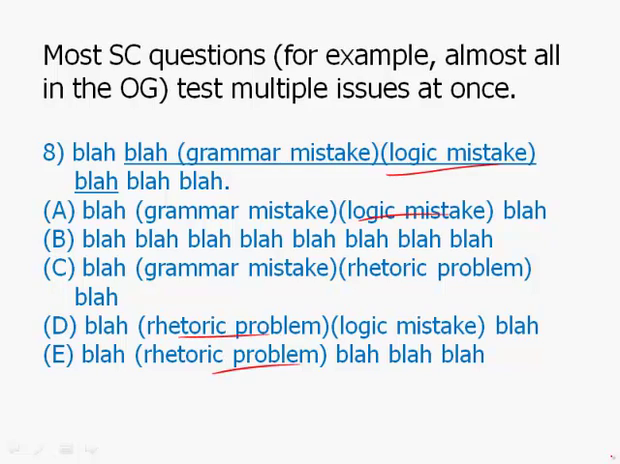 Those are only gonna be sentence correction questions that test those particular issues. As we move through, the questions will test more and more issues, and by the end, they actually will be looking like the full variety you'll see on the GMAT. And a, relatedly, only when you have completed all ten sections are you ready for the full mix of topics that you will see on GMAT questions.